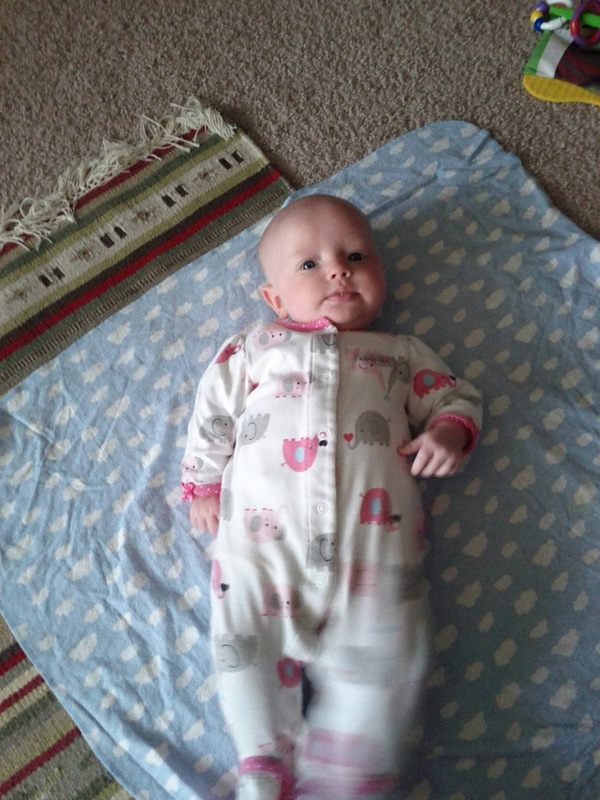 Happy three months day, Eloise! About a week ago, I was reading Mercer Mayer's The New Baby to Jared when I asked him if we have a new baby. He looked around to where Eloise was happily sucking on her fist in her bouncy seat, looked back at me curiously, and said, "No." One of us, at least, can't remember life before Eloise. 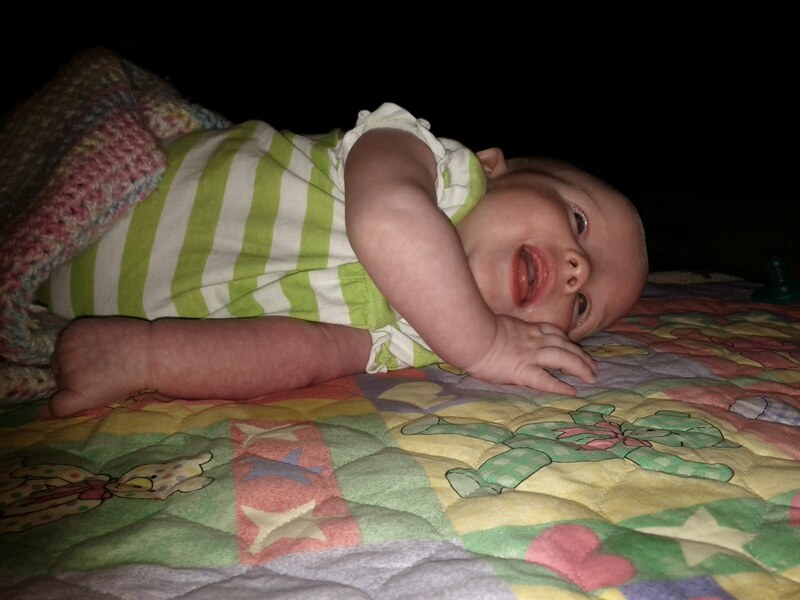 Eloise smiles a lot, especially for Daddy. 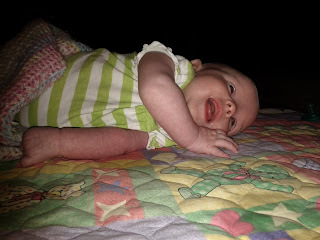 Here is the gummy little grin, captured by Daddy. Eloise is a fantastic sleeper, and has been since before she turned two months old. She usually sleeps between eight and eleven hours at night and then takes a long morning nap. She generally doesn't wake up in the night. Actually, unless you count a couple of 4 a.m. feedings, she doesn't wake up at night at all. 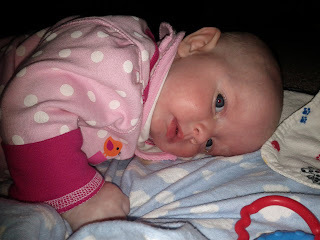 She can now stay awake for a maximum of two hours before she is too tired to function. 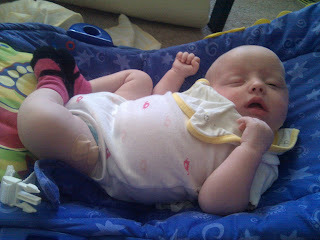 Here she is a month ago sleeping off her two month vaccinations. And the day before yesterday, looking coy. 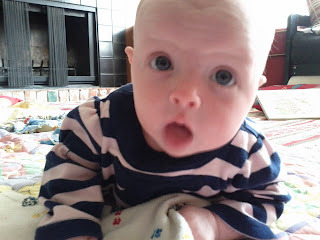 Things were never meant to be exactly equal between siblings, so I try not to worry about the fact that I don't have as much time to just sit and watch her discover the world as I had with Jared. When I do get a chance to spend some time watching her, I have to agree with Todd. She really is pretty, isn't she? 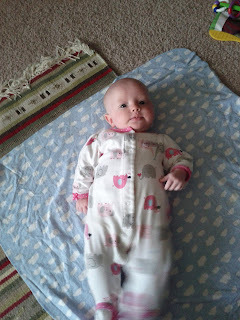 The princess has outgrown nearly all of her clothes in the 0-3 months size. She is too tall. It's hard to tell from pictures, since her legs are always moving or curled up, but her legs are getting long. One thing she hasn't outgrown is the undersized tear ducts of her infancy. That means that she always has tears in her eyes or running down her face. 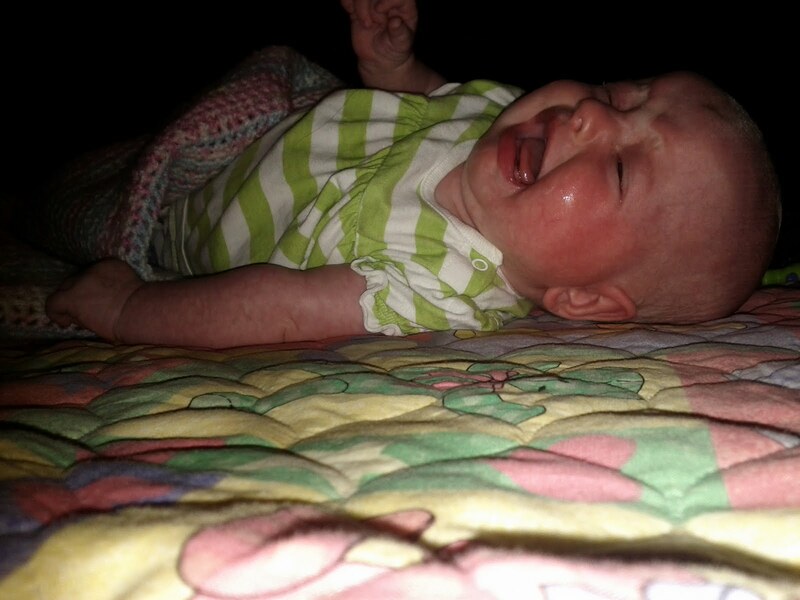 Her pediatrician assures us that her tear ducts will catch up by the time she turns one. Eloise is generally very patient. So far she has been sat on, stepped on, poked, prodded, and excessively loved by one affectionate, but absent minded, toddler. She will wait with only mild fussing to be fed or rocked to sleep, but she has a zero tolerance policy for meal interruptions. Even her frown is pretty adorable. 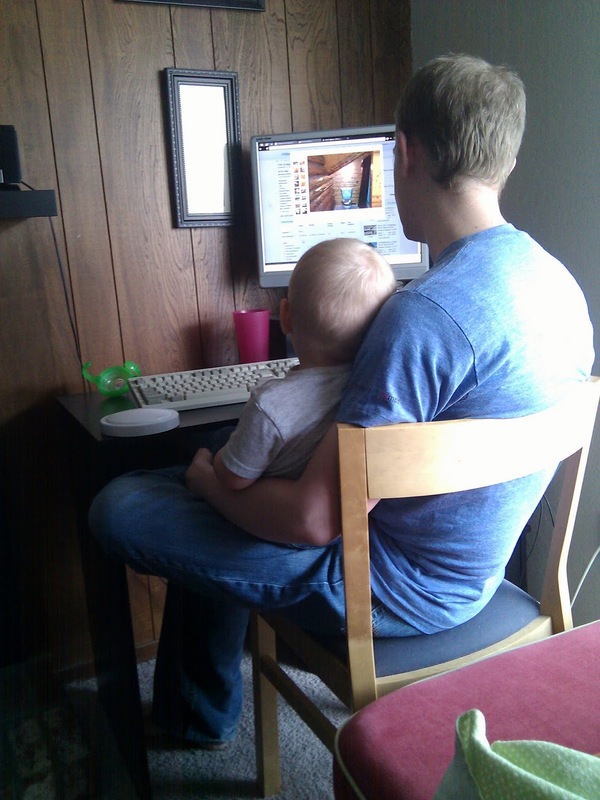 Two days ago I set Eloise in the round chair in Jared's room while I helped him get dressed. He immediately broke away from me and climbed in with her. Next thing I knew, he had her hands and was chanting, "Ring a rosies! Ring a rosies! Ashes, ashes!" Then he climbed out of the chair to demonstrate "All fall down." Eloise was enthralled. She adores Jared, even if she is a bit wary of him sometimes. 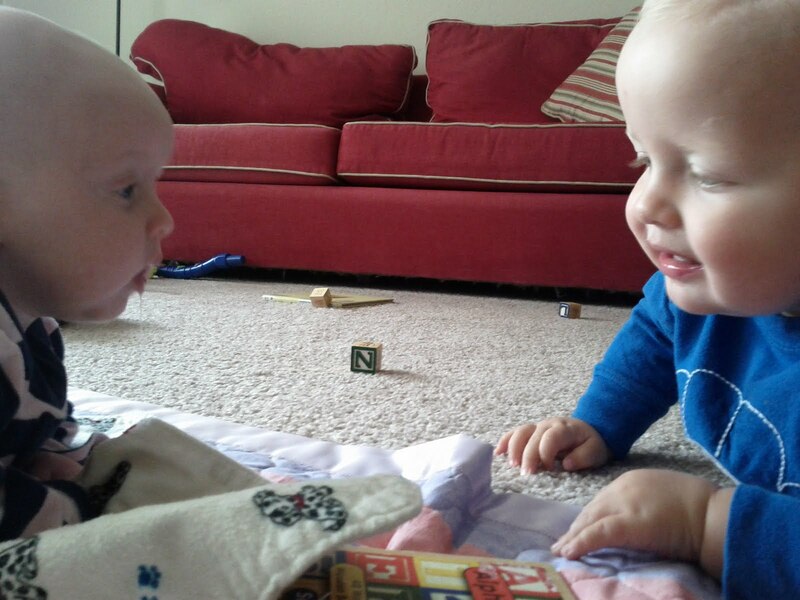 I am excited for them to become playmates. It has been really fun to watch them learning to love each other. Goodbye sleepy newborn. Hello busy baby. Happy three months day, princess! 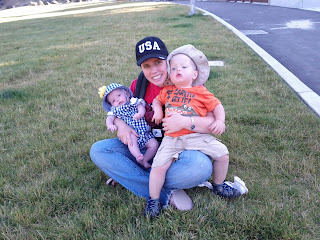 We had an amazing Independence Day weekend this year. Any time Daddy has a four day weekend is an occasion to celebrate. Jared had been asking to go to the temple, and we knew that the Oakland LDS temple would be closed for maintenance for much of the month of July, so we decided to start the weekend with a temple trip. It was just our luck that the temple was closed for the holiday weekend without announcing the closure on their website. The visitor's center was open, though, so we got to walk around the grounds and get some pictures with my hometown friend, Josie Olsen, who is serving in the San Francisco mission. At least Jared got to "Go temple," even if we couldn't go inside. 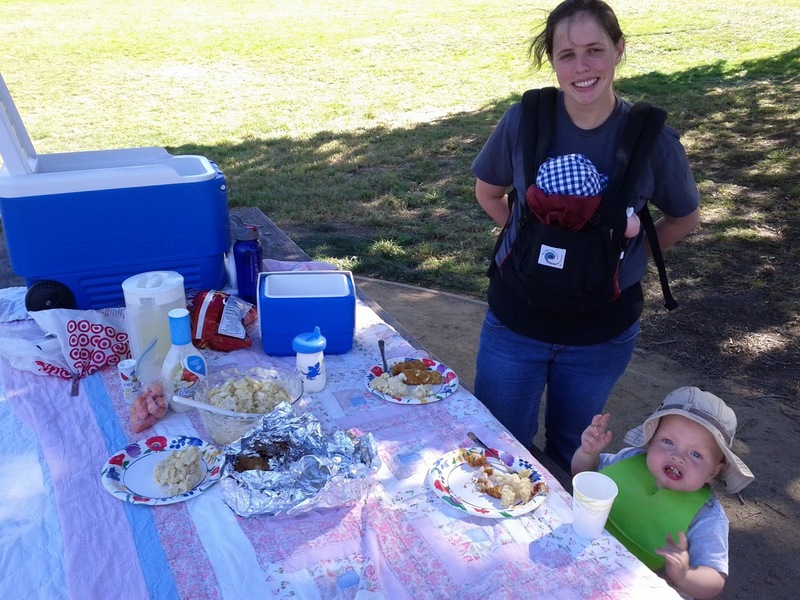 On Saturday afternoon we had a picnic with friends at Washington Park in Burlingame. Washington Park might be my favorite of our urban parks. It was really fun to spend some time chatting and playing games with friends. 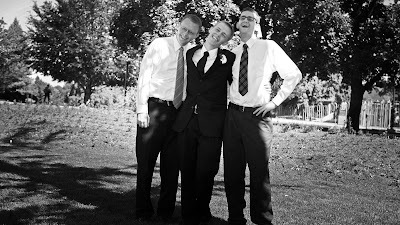 We were actually too busy having fun to remember to take pictures, if you can believe it. On Sunday we had a barbecue at my step-aunt Jenny's house in Pacifica. Here is Eloise stretching and puckering and generally trying not to have to wake up to go to the barbecue. 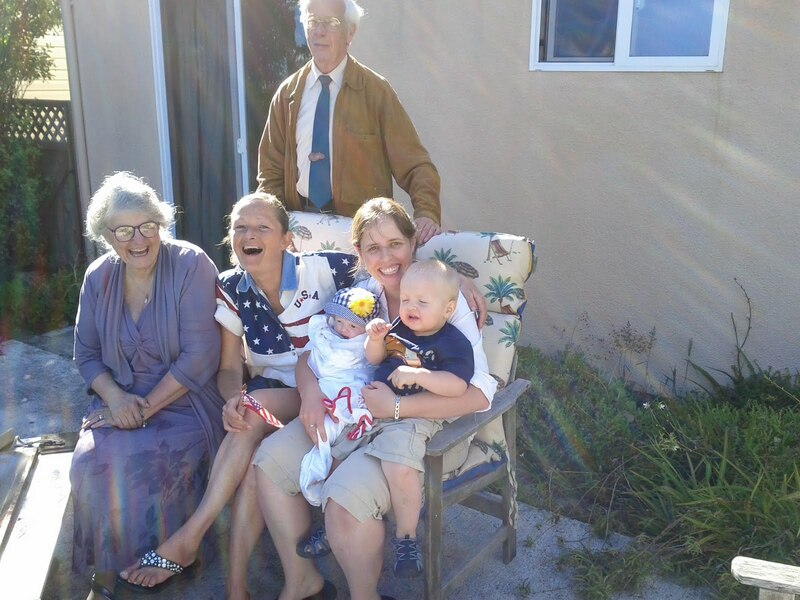 My grandparents, Karl and Bonnie, were passing through the bay area and stopped for the night at Jenny's. It was great to see them. Eloise was all bundled up against the ocean breeze, but the weather was really nice for the rest of us. We had a nice visit and a major over abundance of food; hallmarks of a festive holiday gathering. 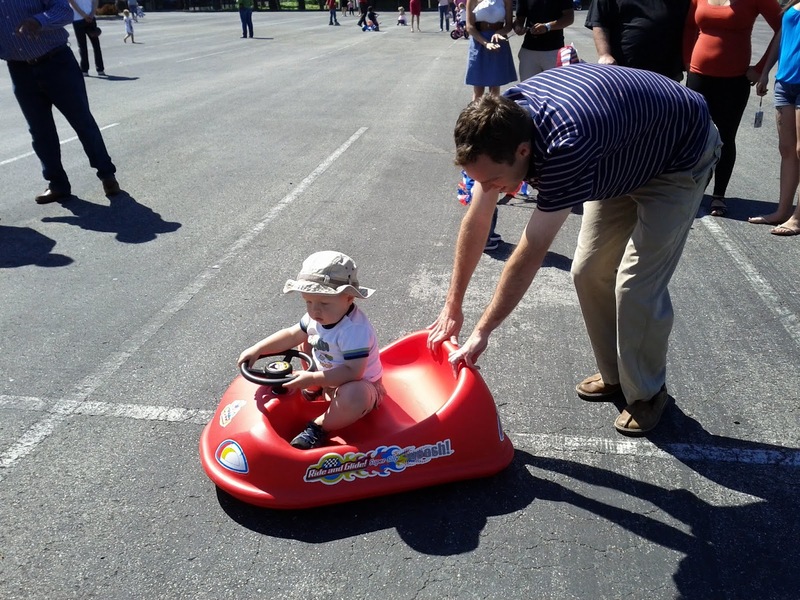 For the fourth of July our ward had a pancake breakfast and bike parade, which consisted of all of the big kids riding their bikes full speed around the parking lot while the smaller kids rode their conveyances in smaller circles and patriotic music blasted from car speakers. 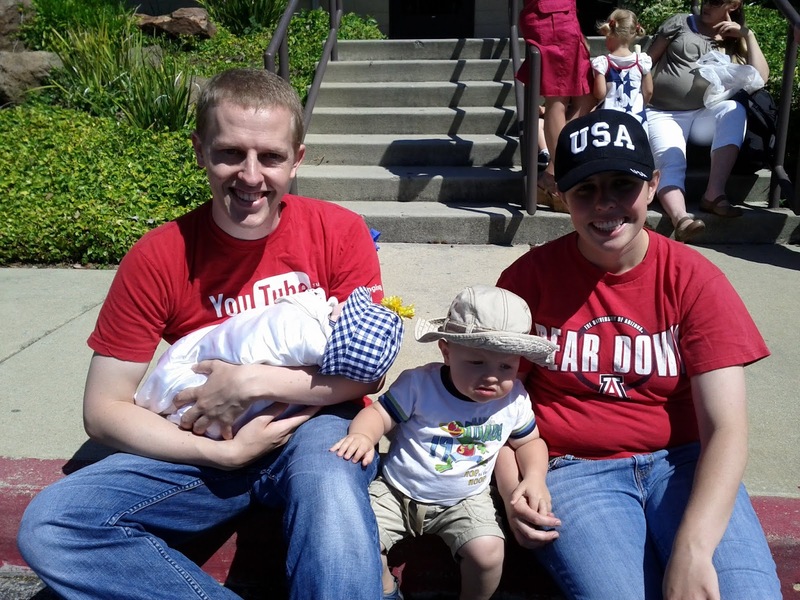 Last year Jared wasn't walking yet, so this was his first time participating in the parade. 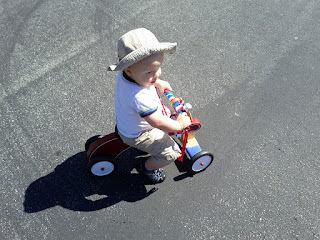 We took his bike and decorated it in red, white, and blue. He preferred to try out the other kids' vehicles. 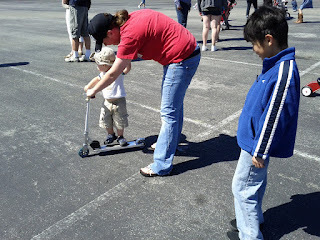 Jaden's scooter. . .
. . . getting a push from the bishop. 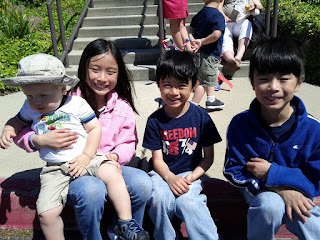 . .
. . .And with his friends Mikayla, Mikael, and Jaden. We managed to get this family picture, thanks to Jaden. If you want someone to manipulate an unfamiliar electronic device with minimal explanation, ask an eight year old. Eloise slept through the parade, of course, and woke up hungry just when it was time to go. This is one of our favorite activities all year. Later, Jared had a watermelon picnic in the tub. This saves a few steps in the clean up process. We had planned to go watch fireworks in Foster City like we did last year, but Jared was starting to show signs of coming down with a serious cold, and Eloise was a bit congested, so we decided it would be better to honor normal bedtimes. 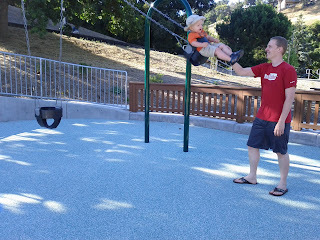 Instead, we went back to Laurelwood Park for a short hike and to play on the playground. Laurelwood Park is a total gem. Even on a holiday with perfect weather it was practically deserted. This was Eloise's first time touching grass. She was unimpressed. At least we got this cute picture of her in her festive plaid. 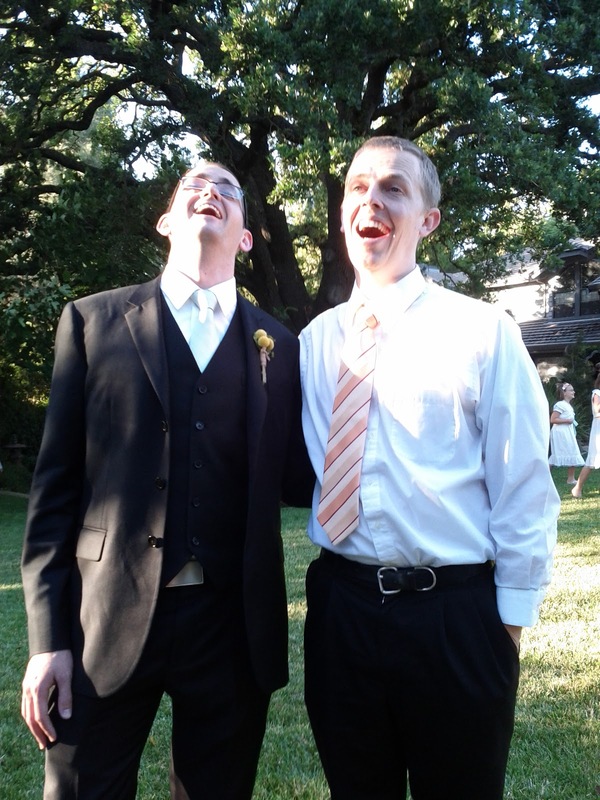 Jared recently discovered the magic of drinking fountains. All of the more modern parks in this area have special drinking fountains with attached basins for dogs to drink from. Jared was delighted by this discovery and announced proudly that he would be drinking PEOPLE water, not dog water. Every time he sees a drinking fountain now he asks for a drink of PEOPLE water. Thanks for making that clear, buddy. July 5th was Todd's last day off work for the holiday. 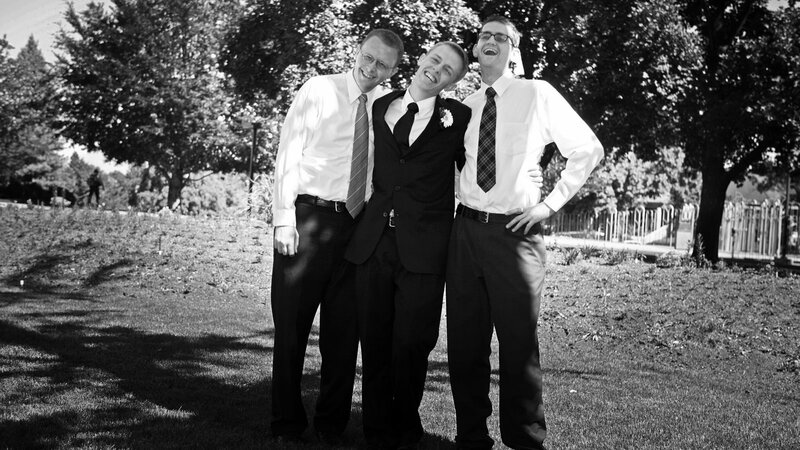 We decided to make it big. First we went back to the temple, after calling to make sure it was open. Jared associates all fountains with the temple. While reading Curious George Gets A Medal, George's attempt to write with a fountain pen elicited happy exclamations of "Temple! Temple fountain!" After naps we went to the beach for the first time since last summer. Jared got some sunscreen in his eye on the ride to the beach. Even though it is supposed to be "tear free" baby sunscreen, he moaned and wailed and his whole face got blotchy and started to develop a rash. Todd was all for turning around and taking him straight home, but that suggestion was met with more wailing and complaining, and Eloise arrived at the beach hungry, so we decided to stay at least until she was fed. Even though we had been hot at home and hot in Oakland in the morning, the beach in Pacifica was windy and chilly. Jared didn't mind the cold one bit. After he recovered from his initial alarm at the ocean, he didn't want to come out of the water. When he started to turn blue, Daddy insisted on making sand castles. Jared loved the sand almost as much as the water. He used his bucket to carry water from the ocean back to his sand toys and dump it in the sand. Eloise did not love the wind and sun, but as soon as she was done eating and out of the sun, the roar of the ocean settled her down. All in all it was an amazing weekend. We wore ourselves out having fun, and we were disappointed that it went by so quickly. The four day weekend was just a warm up for our real summer fun, which starts in less that two weeks when we drive to Utah and Idaho to visit family and friends. We can't wait! Alan and Kaity sitting in a tree. . .
Todd went to the sealing ceremony in the morning, but Eloise isn't old enough for us to feel comfortable leaving her for that long, so Jared, Eloise, and I stayed on the peninsula and went to a baby shower for our friend Siera. We did all get to go to Alan and Kaity's reception that evening. It was at the bride's parent's beautiful house about an hour northeast of where we live. Their yard was HUGE. Jared had a great time running around. It made us feel our growing need for a yard of our own. It sort of captures Alan and Todd perfectly, don't you think? Jared spent a lot of time at the reception playing with cups near the drink table, which led many well intentioned people to offer him water. This translated into FIVE potty stops on the way home. Remember how I said it was an hour drive? The drive home was longer. 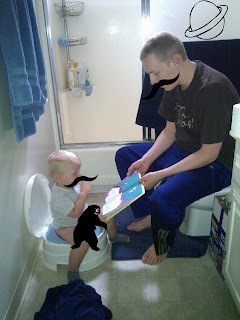 This was possibly one of the low points of our potty training experience. Congratulations Alan and Kaity! We hope to see you again when we are in Utah in a couple of weeks. I know I'm behind. We have been having way too much fun for me to find time to post, of course. Actually, somebody had the bright idea three weeks ago to go all in with potty training our not quite two year old with a high maintenance under three month old in the house, so my hands always seem to be full of hungry, tired, or on the way to the bathroom baby. I've got to admit that the potty training thing was my bad idea. The stress in our house was so thick you could cut it with a knife for about a week and a half. We are much better now. As soon as I acknowledged that it wasn't working we all relaxed and it started working. Jared is almost potty trained. 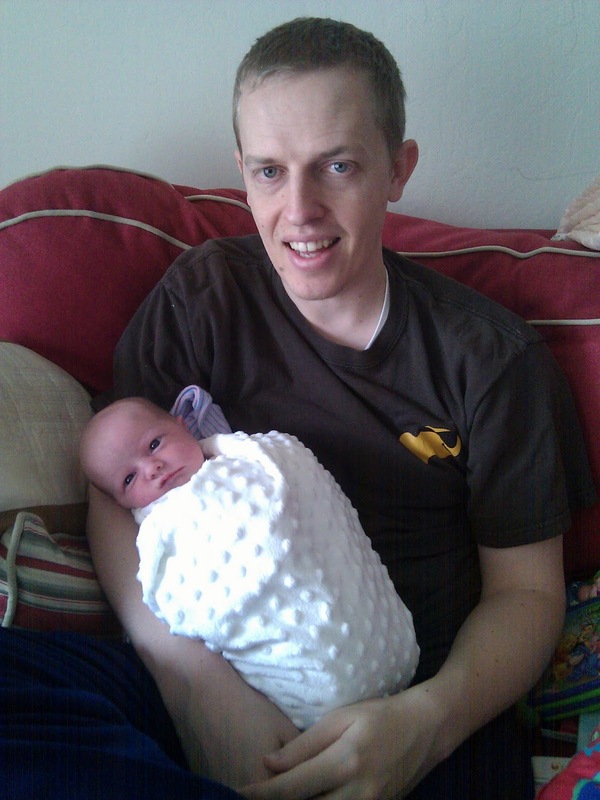 Our father's day was great this year. At least I thought it was. 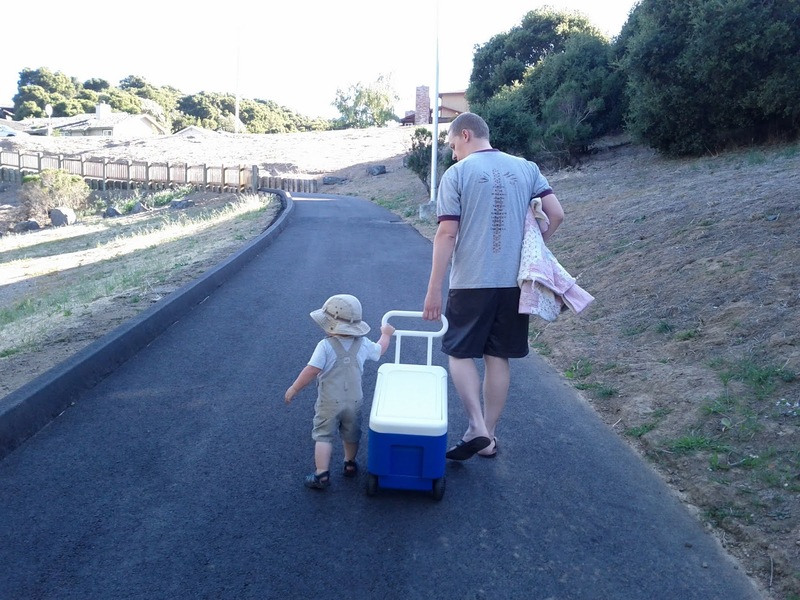 Jared and I went to the store on Saturday and got a new cooler for Daddy to take on picnics. On Sunday we made a picnic and went to Laurelwood Park to enjoy some sunshine and warm weather. The park was wonderful. Unlike the parks closer to home, it wasn't remotely crowded. We had our choice of four picnic tables, a great big lawn all to ourselves, and a really great fenced playground far from the road. 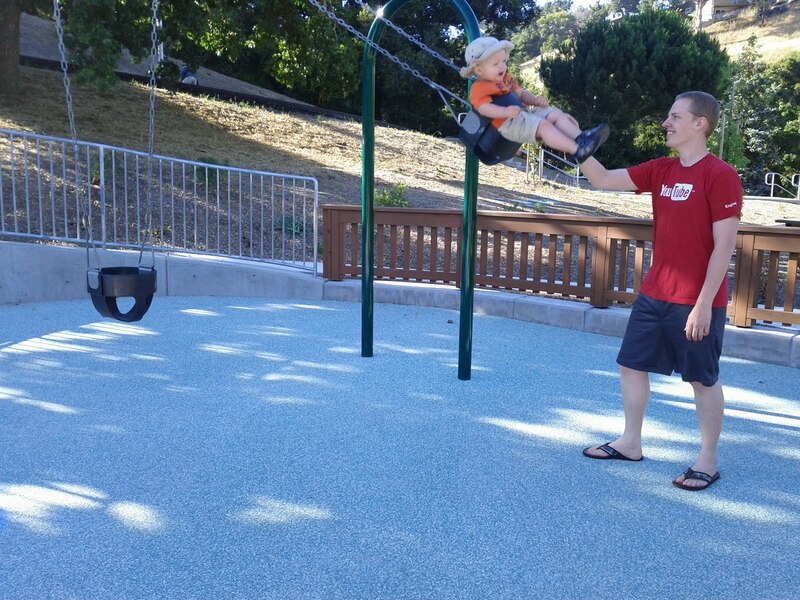 We apartment dwellers become park experts, and this park was worth the drive. The day was gorgeous, too, if a little bit windy. We are thankful for all of the important dads in our lives, especially our #1 Daddy! Becoming a father for the first time almost two years ago. . .
and becoming a daddy again in April. Jared wants to be just like Daddy. He couldn't have a better role model. 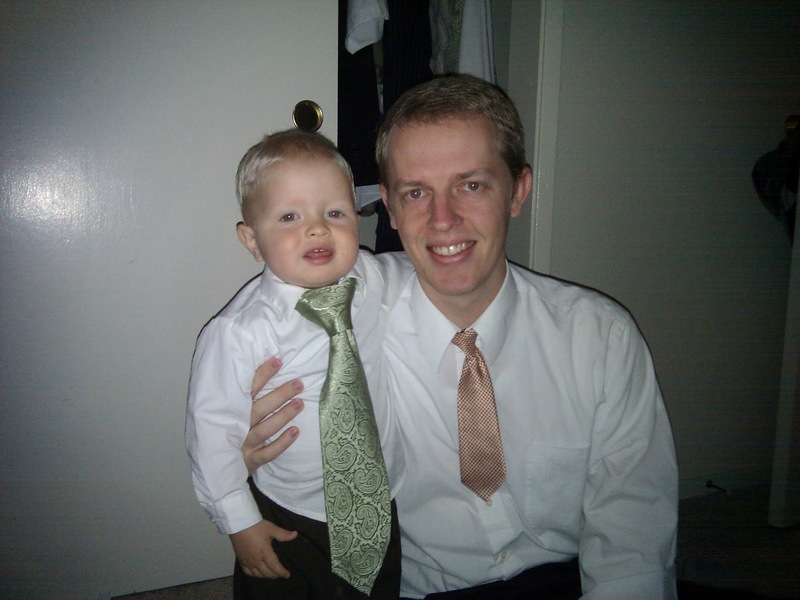 Thanks for all you do, Daddy! We love you.